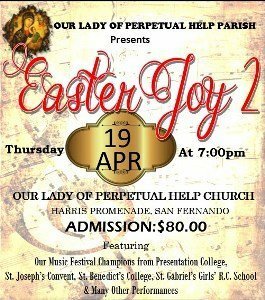 Our Lady of Perpetual Help parish will be having a Concert “Easter Joy 2” on Thursday 19th April, 2018 @7:00pm in the Church. Cost $80.00. Entertainment by Music Festival Champions & other performances. Proceeds go towards the re-tiling and beautification of Our Lady’s Grotto. Tickets can be purchased from Cynthia Mootoo, St. Joseph’s Convent, Presentation College, St. Benedict’s College, San Fernando Boys’ R.C. and St. Gabriel’s Girls’, as well as from Christ the King R.C., St. Andrew Kaggwa. PLEASE COME OUT AND SUPPORT OUR YOUTH!! !